The Return of the Hunter. Jaipur Palace. Jaipur. March 27 – May 3, 2014. 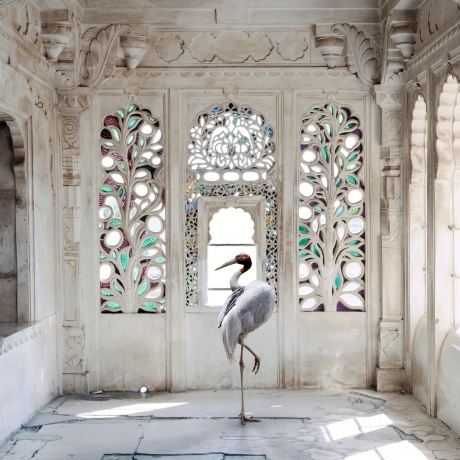 For the gallery’s second exhibition of Karen Knorr’s work, we will be presenting the first American showing of her 'Fables' series along with new work from her ongoing 'India Song'. 'Fables', shot between 2003 and 2009 in various European museums, was Knorr’s earlier exploration of the disjunction between nature and culture, bringing the historical tradition of picturing animals squarely into the 21st century. The methodology developed in 'Fables' led Knorr to India where she photographed in the sumptuous palaces and temples of Rajasthan. In both works Knorr playfully combines technologies and genres, mixing digital and analogue, architectural and wildlife photography. Now working entirely digitally, large format digital images of interiors are combined with animal figures photographed separately and then inserted into the environment of the artist’s choice. The boundaries of the real are thus challenged both by this hybrid process and also by the incongruity of the scenes. It is this very ambiguity that gives Knorr’s images their force. Knorr points out that the usual aim of fables is to teach a lesson by drawing attention to animal behavior and its relationship to human actions and shortcomings. Animals in fables speak metaphorically of human folly, criticizing human nature. Yet in Knorr’s 'Fables' and 'India Song' the animals are neither dressed up to resemble humans nor do they illustrate any explicit moral. Liberated from narrative constraints, they roam freely in human territory, drawing attention to the unbridged gap between nature and culture. They encroach into the domain of museums and palaces, showing us the incommensurable distance between two worlds: raw nature on the one hand and on the other the cultural site which allows nature entry only in the form of a representation. Karen Knorr was born in Frankfurt am Main, Germany, raised in San Juan, Puerto Rico, and educated in Paris and London. She has lived in England since the 1970s, creating a large body of work that has developed a critical and playful dialogue with photography. Her themes range from investigating the patriarchal values of the English upper classes to addressing the role of animals and their representation in art. Using photography to explore cultural traditions, from the gentlemen's clubs of Saint James to the luxuriant interiors of Indian palaces, Knorr's work reaches out to engage conceptual art, visual culture and feminism.